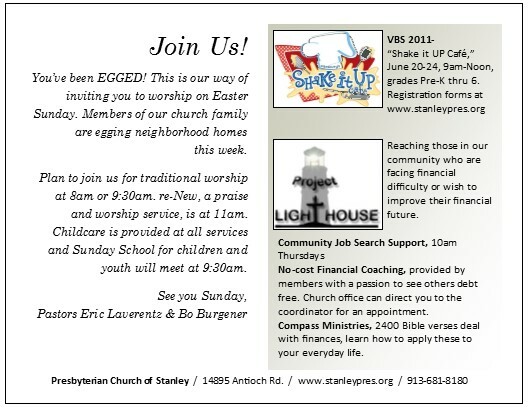 GIS: Innovative way to invite people to Easter services: “Egg” your neighborhood! You are here: Home / Communications / Church Outreach and Marketing / GIS: Innovative way to invite people to Easter services: “Egg” your neighborhood! "Egg" your neighborhood with an invitation and an egg filled with candy--great idea for outreach and Easter promotion! This is one of the most creative ideas I've ever seen to invite people to Easter. It was sent in by a contributor to our Great Idea Swap . In addition to being a great invitation to Easter, it also gives potential visitors great information about church ministries and outreach activities. It is very important to do this because you are letting your community know that the church is about so much more than holding special events. They may not attend your church for Easter, but if they are new to the community or lonely, the invitation gives information about regular services and small groups. In addition, the church lists Job Search Support and No Cost Financial Counseling and this is a wonderful way to let the community know the church cares about the whole person. At the end of this article is a link where you download the PDF and editable file of invitation. We egg 3,000 houses in the surrounding area. Our church has a membership of 1,000, about member 550 families. 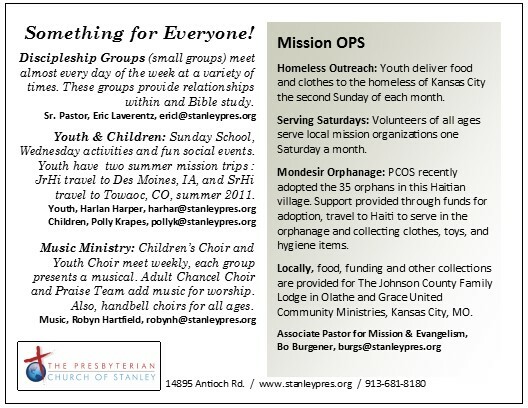 The Presbyterian Church of Stanley is in Overland Park, KS a suburb of Kansas City. We ask for volunteers to “Egg Houses.” This is promoted through all media in the church and we post a large map so everyone can see how many houses we really reach out to. Volunteers donate and stuff 3,000 eggs with candy. We attach a printed label, “Happy Easter” and include the worship times. We have about 30 route maps with 100 +/- houses listed. Families love to take kids out and deliver the eggs, they are bagged in 100’s with a map attached. Last year we included a printed plastic tumbler promoting our new contemporary service, postcard of our family/kid friendly and VBS registration form. We don’t ring doors, simply leave them on the front porch in hopes they will be found by the resident. Yes, the first year required more time to create the route maps but after that it was easy for volunteers to manage the outreach project. Be creative and do a similar invitation for your church! If you come up with a unique idea or way to use this or have others you'd like to share of what your church has done for Lent or Easter in the past, PLEASE let us know. CLICK HERE to download the ZIP File for the EGG invitation.